There are many ways of connecting small electric motors to Arduino platforms. The easiest and most popular methods are connecting it via an H bridge or transistors. When connecting electric motors to an Arduino platform you must remember not to connect them directly, because that could damage the programming platform. Why should you connect electric motors to Arduino platforms? Implementing electric motors into modules and controlling them via Arduino opens up numerous possibilities. The main purpose of connecting motors is to move module components, build vehicles, and even create robots. Arduino lets you control both the motor shaft rotation direction and its rotational speed. 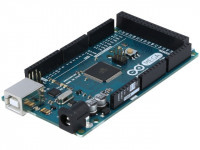 Connecting a programming platform directly to a motor not only creates a risk of burning the Arduino platform's external port but also reduces your control capabilities of that module to a minimum. Arduino platforms can supply current of approx. 20mA via all their external ports, while all electric motors – even the smallest ones available on the market – require currents from ten times to one thousand times stronger than that in order to function properly. That's why it is vital to connect each electric motor to an Arduino platform indirectly, via an appropriate driver that will regulate the current transferred to that motor. Which motors can be connected to Arduino platform? What to look for when choosing them? line speed [mm/s] – applies only to linear actuators and determines the speed at which the motor can extend its shaft in a linear motion. Once you are familiar with the types of motors that can be connected to an Arduino platform and you know which parameters are important when choosing them, you can proceed to connecting a motor. Standard brushed DC motors, vibration motors, and servo motors are the easiest to connect. Connecting linear actuators, stepper motors, and pumps is slightly more difficult. Brushed DC motors and vibration motors are the simplest, most common, and easiest to connect. Typically, you should connect 1A–5A motors that operate with a voltage of 5V–9V to the programming platform. More powerful motors require special drivers. Brushed DC motors and vibration motors can be connected via transistor or H bridge. The first connection method only lets you control the shaft rotational speed, while the bridge method lets you control both the rotational speed and direction. Choose the connection method best suited to your needs. Connecting a brushed DC motor and a vibration motor via a transistor is very simple and requires only three components: a current limiting resistor , a rectifying diode, and a transistor. You can use e.g. a 1N4148 or 1N4007 rectifier diode, a 2N2222 transistor, and a 10kΩ current limiting resistor in your module. Begin the installation by choosing the Arduino pin with the right output voltage. Connect that Arduino pin to a resistor via a breadboard, and then – at the very end – connect it to transistor base. Ground the transistor's emitter and connect its collector to the motor via a parallel rectifier diode. Connect the motor to power supply. The resistor limits the current supplied to the transistor while the rectifier diode lowers the risk of back-EMF and voltage peaks that may occur when switching the module on. Back-EMF and voltage peaks could damage the programming platform. pins: 4, 5, 12, 13 – grounded (connected to GND). First, place the H bridge on the breadboard. Next, connect the bridge's ground to a power supply. Then, power the engine(s) on. Following that, power on the logic that controls the bridge. Finally, connect the pins that control the operation of engine(s). Before you start connecting all components, keep in mind that an H bridge and electric motor circuit can be powered with one or two voltages. If you choose to power it with one voltage, you will have to use a power source with a good voltage filter that will sufficiently lower the risk of interference. A better, more popular, and safer solution is powering your module with two sources – powering the motor via the bridge, and powering the bridge's logic that controls the motor from another independent power source. Therefore, it's a good idea to connect a 5V Arduino pin to the bridge's logic, and connect the remaining power sources to bridge pins that control the motor. Connecting servo motors is extremely easy since their pin layouts are always the same. When connecting a servo motor to an Arduino platform, start by connecting the power ground of your motor and the module's power source (usually two 5-volt power sources). Next, connect the PWM Arduino output (marked with a "~") to the pin that will control the servo motor. Once you've finished connecting all components, you only need to load the right library. Stepper motors are connected to Arduino indirectly, via dedicated drivers. Those component must be matched in regards to maximum current and rated voltage, and the driver itself must be matched to both the motor's and the entire module's supply voltages. Driver's current capacity must be larger than the maximum current consumed by the motor. For the purposes of this article, let's say we want to connect a 12V stepper motor to an Arduino platform. It is compatible with e.g the A4988 driver. First, place the driver on a breadboard, and then connect the GND and VDD pins to the driver's power source (3V – 5.5V). Next, connect the GMD and VMOT pins to the motor's power source, and connect the SLP pin to the RST pin. Connect pins: 1A, 2A, 1B, and 2B to the motor. The connection method of 1A, 2A, 1B, and 2B pins depends on the stepper motor's type (bipolar/unipolar). For bipolar motors, connect the 1A pin to the motor's black cable, 2A pin to the red cable, 1B pin to the green cable, and finally – 2B pin to the blue cable. Unipolar motors have six cables, but we don't have to connect the yellow and white cables. Connecting a stepper motor to an Arduino platform correctly makes that motor's shaft rotate right in a high state and left in a low state. For rising edge, the shaft moves only one step, and its direction depends on the connection of the DIR pin.